One of my goals this year was to learn the crocodile stitch. I watched several you-tube videos on the stitch and while there are a few different variations, the stitch is generally crocheted the same. Some people work a chain stitch between scales and others end the rows a little differently. 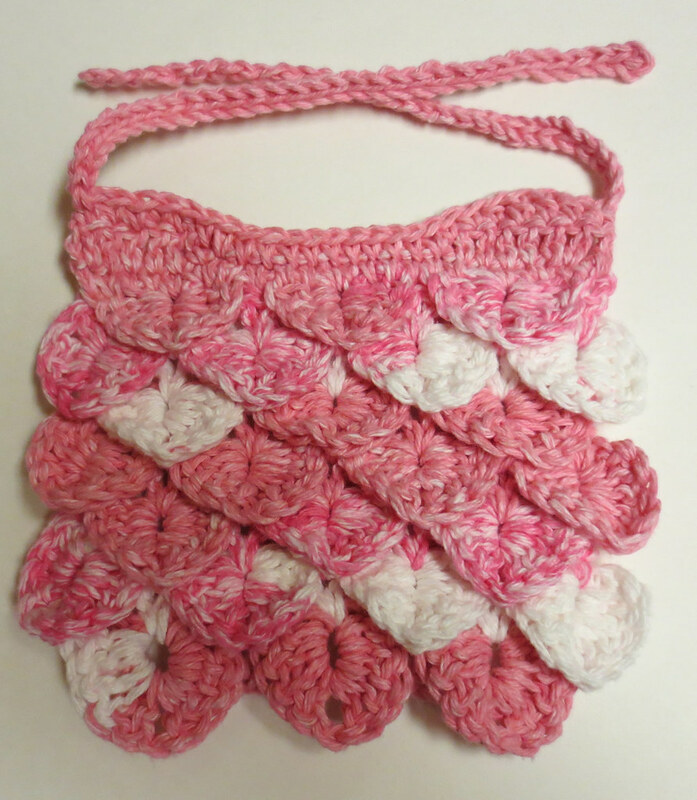 Here is a quick and simple little crocheted baby bib pattern I came up with using the crocodile stitch. If you are learning this stitch for the first time, you may find this instructional post and video helpful as you learn the stitch. The crocodile stitch is easy once you get the hang of working the base rows and scale rows. I hope you enjoy crocheting the baby bib pattern and working the crocodile stitch. Baby bib measures 7 inches wide x 7 inches long with 9 inch ties. With I hook, Ch 18 loosely. Dc in 3rd chain from hook.